Walter J. Boyne (born 1929) is a retired United States Air Force officer, Command Pilot, combat veteran, aviation historian, and author of more than 50 books and over 1,000 magazine articles. He is a former director of the National Air and Space Museum of the Smithsonian Institution and a former Chairman of the National Aeronautic Association. Walter Boyne grew up the son of a poor family in East Saint Louis, Illinois during the time of the Great Depression. He attended Holy Angels grade school where he first discovered an interest in writing. His love of flying was encouraged by dime novels of the day such as Robert J. Hogan's G-8 and His Battle Aces that depicted "America's World War I Flying Spy" engaged in air-to-air combat. He decided at this young age that he would become a pilot for the Air Force and focused his efforts to achieve that goal. Boyne earned a number of scholarships that enabled him to attend Washington University in St. Louis. In May 1951, after two years at the university, Boyne entered the U.S. Air Force's Aviation Cadet program, where he learned a profound respect for the enlisted grades of the military. Boyne started flight school in November 1951 and became the first of his class to solo. On December 19, 1952 he was awarded his wings as an Air Force Pilot and a commission as a Second Lieutenant in the United States Air Force. While stationed at Castle Air Force Base in central California, Boyne flew the B-50 Superfortress as a member of the 330th Bomb Squadron of the 93rd Bomb Wing. 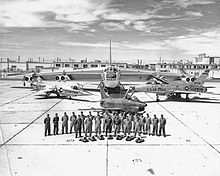 Although Boyne had relatively few hours in bombers, he received orders in May 1954 to McConnell Air Force Base in Wichita, Kansas for training in the B-47 Stratojet, which he flew for several years. In 1957, he returned to college and graduated with honors from the University of California, Berkeley with a bachelor's degree in business administration. Boyne continued his education and later earned a master's degree in business administration from the University of Pittsburgh. Boyne returned to active flying as a nuclear test pilot with the 4925th Nuclear Test Group at Kirtland Air Force Base near Albuquerque, New Mexico. While at Kirtland, he became an aircraft commander in both the B-47 and B-52 Stratofortress. Boyne served during the Vietnam War as commander of the 635th Services Squadron at U-Tapao Royal Thai Air Base where he flew 120 combat hours as a C-47 Skytrain instructor pilot. Colonel Boyne retired from the Air Force on June 1, 1974 with more than 5,000 hours in various military aircraft. Boyne began his writing career in 1962 while still in the Air Force. Tired of the repetitive aviation articles of the time, he chose to write about lesser-known people and airplanes starting with an article on the Curtiss P-36. Boyne's article was accepted by a magazine in Britain which paid him $29 — a moment of special pride for the new author. The P-36 aircraft now resides in the National Museum of the United States Air Force at Wright-Patterson AFB near Dayton, Ohio. A very prolific writer, Boyne is the author of over fifty books and over one thousand magazine articles. In 1974, after retiring from the Air Force, Boyne joined the National Air and Space Museum as curator of air transport. Prior to the opening of the museum in 1976, he was assigned responsibility for introducing all aircraft into their exhibits. Boyne was also responsible for transforming the museum's dilapidated Silver Hill facility into the world's premier restoration facility. He also organized the effort to rename the facility in honor of Paul E. Garber, a curator of the National Air Museum—the predecessor to the National Air and Space Museum. Boyne previously served as Chairman of the Board of the National Aeronautic Association, the oldest aviation organization in the United States, stepping down in 2014. In 1984, Boyne was awarded an honorary Doctorate in Aerospace Sciences from Salem College, West Virginia. In 1987, the National Aeronautic Association (NAA) awarded him the Cliff Henderson Trophy for lifetime achievement in aviation. In 1998, the NAA named him a Distinguished Statesman of Aviation that honors outstanding living Americans that have made contributions of significant value to aeronautics. Also in 1998, the Fédération Aéronautique Internationale honored Boyne with the Paul Tissandier Diploma awarded to those who have served the cause of Aviation in general and Sporting Aviation in particular. In 2005, the Aircraft Industries Association presented Boyne with the Lauren D. Lyman Award for outstanding achievement in aviation public relations. In 2007, he was enshrined in the National Aviation Hall of Fame. In 2016, the Aero Club of Washington, D.C. awarded Boyne the Donald D. Engen Trophy for Aviation Excellence. ^ a b c d e f g h i j "NAHF Walter Boyne Biography". 2007. ^ Boyne 2009, p. 63. ^ Boyne 2009, p. 69. ^ a b c d e f g h i j k l "Aviation Pioneers: A Biography of Walter J. Boyne". 2004. Retrieved February 2, 2019. ^ Boyne, Walter J. (2011). How the Helicopter Changed Modern Warfare. Pelican Publishing. ISBN 1-58980-700-6. ^ Boyne, Walter J.; Handleman, Philip (2018). The 25 Most Influential Aircraft of All Time. Lyons Press. ISBN 1-49302-630-5. ^ a b "Record Unit 338". 2007. Retrieved January 2, 2017. ^ "NASM 1983 Chronology". Washington, D.C.: Smithsonian Institution. Archived from the original on June 6, 2011. Retrieved January 2, 2017. ^ "United States Patent 4941125". 1990. ^ Dorr 2016, p. 32. ^ Gaffney, Jonathon (May–June 2014). "President's Message". The NAA Record. Washington, D.C.: National Aeronautic Association. Retrieved January 18, 2017. ^ "Henderson Trophy Recipient Chronology". Washington, D.C.: National Aeronautic Association. Retrieved January 2, 2017. ^ "McDonald Distinguished Statesman Recipients". Washington, D.C.: National Aeronautic Association. Retrieved January 2, 2017. ^ "Paul Tissandier Diploma". Lausanne, Switzerland: Fédération Aéronautique Internationale. Archived from the original on May 27, 2013. Retrieved January 2, 2017. ^ "Walter J. Boyne Named Lyman Award Winner". Arlington, Virginia: Aerospace Industries Association. December 14, 2005. Retrieved January 2, 2017. ^ "Recipients of the Donald D. Engen Aero Club Trophy for Aviation Excellence". Washington, D.C.: Aero Club. 2016. Retrieved January 20, 2017. "Aviation Pioneers: A Biography of Walter J. Boyne". Wings Over Kansas. Wichita, Kansas: Chance Communications, Inc. 2004. Retrieved June 21, 2009. Boyne, Walter J. (June–July 2009). "The Dawn of Discipline". Air & Space/Smithsonian. Washington, D.C.: Smithsonian Enterprises. 24 (2): 62–69. ISSN 0886-2257. Retrieved July 3, 2009. Dorr, Robert F. (February 2016). "The Man Who Knows Everything". Flight Journal. Wilton, Connecticut: Air Age Inc. 22 (1). Holden, Henry M. (May 2007). "Into the Wild Blue with Walter J. Boyne". Centennial Aviation & Business Journal. Centennial, Colorado: Airport Journals. Retrieved January 2, 2017. "NAHF Walter Boyne Biography". Dayton, Ohio: National Aviation Hall of Fame. 2007. Retrieved January 2, 2017. "Record Unit 338". Finding Aids to Official Records of the Smithsonian Institution. Washington, D.C.: Smithsonian Institution. February 15, 2007. Retrieved January 2, 2017. "United States Patent 4941125: Information storage and retrieval system". USPTO Patent Full-Text and Image Database. Alexandria, Virginia: United States Patent and Trademark Office. July 10, 1990. Retrieved July 10, 2009. Boyne, Walter J. "Flying with Walter J. Boyne". Ashburn Virginia. Retrieved June 21, 2009.